There is no other place on the planet as magnificent as Hawaii to celebrate the essence of your love. Known as the “Valley Isle,” Maui is the ideal Hawaiian wedding destination. The beauty of Maui creates a stunning back drop for this very special day. 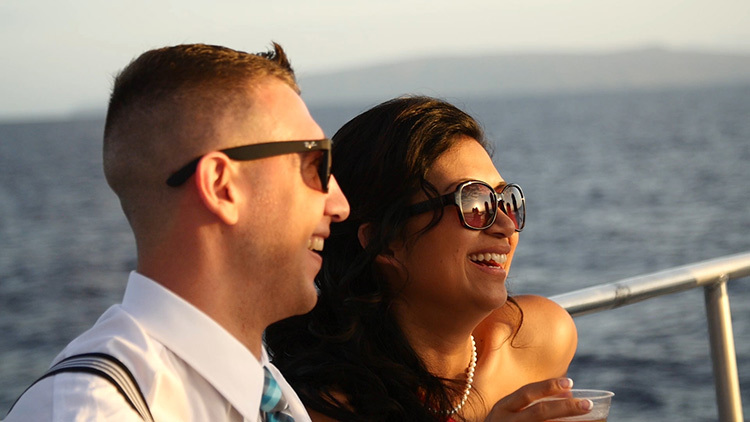 Make your Maui wedding an unforgettable experience, aboard our spacious and stable yacht, the Pride of Maui. Relax on the sprawling observation deck, with unobstructed panoramic views of the majestic mountains and magnificent coast. During whale season, sightings of the Humpback whales are common. Experience tranquility, as only a Maui wedding on the ocean can provide. With gentle trade winds and expansive sky overhead, the stage is set for a unique and romantic Maui wedding event. Share the serenity with loved ones and friends as the blue sky turns gold, then peach, while the sun slowly melts into the glistening sea. From a simple pre-wedding cocktail cruise to a lavish Maui wedding reception dinner, our Maui wedding specialists are eager to exceed your expectations. With more than 30 years in the business you can relax, as our expert wedding planners work diligently to deliver a Maui wedding event tailored to your individual interests. 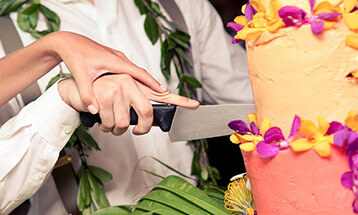 We offer a variety of Maui wedding options for your consideration. You may custom design your Maui wedding cruise or select from our wedding packages. They are designed with ease of planning, so that you can relax and fully appreciate your Maui wedding event. Local flower farms provide unique and stunning floral arrangements. Freshly picked and brilliant, are centerpieces that attract immediate attention and make a statement that yours is a very special wedding event! Tables, chairs and windows will be covered with linen, in your favorite colors that complement the centerpieces and floral arrangements. 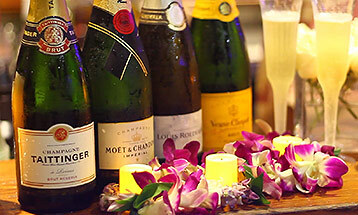 Menus, cocktail service and entertainment are created around your individual preferences. Savor sumptuous cuisine paired with fine wine, served on linen and crystal, inside the spacious main cabin. You may prefer hand passed hors d’oeuvres with refreshing tropical beverages and decadent dessert, or a simple wine and cheese party, featuring fresh island fruit and champagne. Relax to the music of Hawaii’s top artists performing live or bring your favorite CDs to be played over the house system. No matter how simple or elaborate you have dreamed your Maui wedding, we’ll see to all of the details, while you relax. This is an evening of excitement, romance, beautiful scenery, conversation, delicious food, drink, and dance. Yours is a Maui wedding cruise under the sky, and on the sea, where the soul runs free. This is the perfect Maui wedding, and one you and your guests will not soon forget! Call us toll free, and ask for Annie, our senior Maui Events planner. Natalie is known for capturing the essence of the couple and their special guests and focuses on quality, creativity and professionalism. No matter what size and length of the ceremony and reception, Natalie’s wedding photography will commemorate your Maui wedding day through exquisite photographs. BOOK YOUR WEDDING CRUISE TODAY!